Each Month The Poker Father is GIVING AWAY $100! 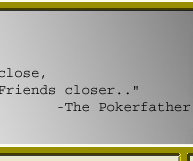 In order for the Online Poker Rooms to keep giving us their Great Promotions, ThePokerfather.com needs friends and family to keep visiting our site. So, if you think our site is COOL and Offers Great Promotions please let your friends know about us by filling in the form below and sending them an email! 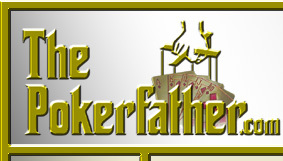 As a thank-you we will automatically enter you in The Poker Father Contest where you could WIN $100! 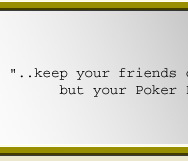 The more friends you tell the more chances you have to win! Please see FULL DETAILS and RULES below! Click Here to see what the email will look like. • Every five different friends you send an email to per month gives you one more chance of winning the $100. The more emails you send, the more chances you have to win. • In order for a friend's email address to be "qualified" it must be valid and only used once per month by you. In addition, you must know ALL the people you send the emails too. • If a friend/family member has requested that you stop sending them and email YOU WILL oblige to their request and NOT send them another email. • The Pokerfather WILL NOT tolerate SPAM Mail or Fraudulent Conduct. Anyone caught doing either of the two will be disqualified and the Authorities WILL BE NOTIFIED. • The contest resets every month. Therefore, you can resend the emails to the same friends/family members as you did in the previous month and this WILL count as a another chance for you to win the $100 in the current month's contest. REMEMBER: In order for a friend's email address to be qualified it must be valid and only used once per month by you. • A winner is RANDOMLY chosen each month and will be contacted via the email address he/she used in the above form. The winner has 7 days to reply to the email to claim their prize. If they take longer then 7 days a new winner will be chosen and the same rules will apply. • ThePokerfather.com has the right to change and/or modify this contest WITHOUT notice to you. In addition, The Pokerfather's decision will be the final decision if any conflicts may occur. • The Pokerfather DOES NOT guarantee that you will WIN the $100. The probability of winning will depend on how many "qualified" emails you send PER MONTH by the total number of "qualified" emails sent PER MONTH. • You must be 18 years of age or older to be eligible for this contest and you must live in a state/province/country that allows online contests. Please check with your local authorities. • ThePokerfather.com accepts no responsibility for anyone who enters this contest from a country who does not allow online contests. In addition, ThePokerfather.com accepts no responsibility for any financial charges that you may incur for engaging in an online contest. It is up to you find out if online contests are legal where you reside.